The roof of this property has been completely renovated on both sides of the main house. The structure looks quite healthy, with the exception of the attached barn, which now needs to be re-roofed. Considerable work has been done indoors, but there is still a long way to go! The house is very habitable. A large hallway, dining room / 2nd living room, kitchen, breakfast room with wood burning stove, cozy double exposure lounge. Upstairs 3 bedrooms and a very nice bathroom with walk-in bath and modern shower. The staircase leading to the second floor gives access to a large attic which has been largely insulated and waiting to be converted into additional accommodation - if necessary. Outside there is the huge barn attached to the house (requiring a new roof) and several additional stone outbuildings. Good size garden with some mature trees and a stream flowing along the boundary. Garage entrance at the back of the garden and courtyard. The photos of the interior do not do justice to the property and once the various parts released, it will reveal the size and potential of this property. It could be a dream home near the popular town of Begard with all the amenities. Local shops are only minutes away. 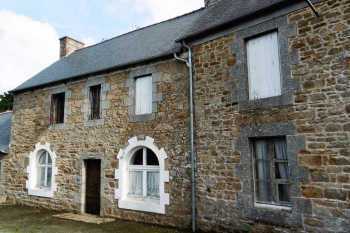 The historic town of Lannion with all major retail outlets is a 15 minute drive. The beach is about 20 minutes north and the popular estuaries of Treguier and Pontrieux are nearby. A haven for boating and fishing. Toddlers will enjoy the local Armoripark Park which provides hours of entertainment for the entire family. Ideal holiday property, opportunity to operate different types of businesses or just the perfect place to retire.